It was about this time last year that I was on my way to Atlanta for yet another gift show, lugging a 90-lb. suitcase through the airport. Most of my summer had been spent either traveling to shows or getting ready for them, and in this case a last-minute product brainstorm led to the need for me to ‘hand-carry’ new samples (and display!) to the show. This was nothing new for me after 16+ trade show seasons, as I had experienced the very real pressure that these shows put on small businesses. The schedule is rigorous, the shows are expensive, and the fear of rejection is very real. And while it was never actually the case – it often felt like the success of the entire season rested on the response at a single trade show. However, these shows do represent a real opportunity for designers and makers. Given increasing costs and the small margin for creating a return on trade show investments, it’s so important that exhibitors extend the reach of these events. Among all of the other things on your plate, I encourage you to think about how to use your digital platforms (email, social media, websites) to continue the conversation before, during and after these 3-5 day shows. 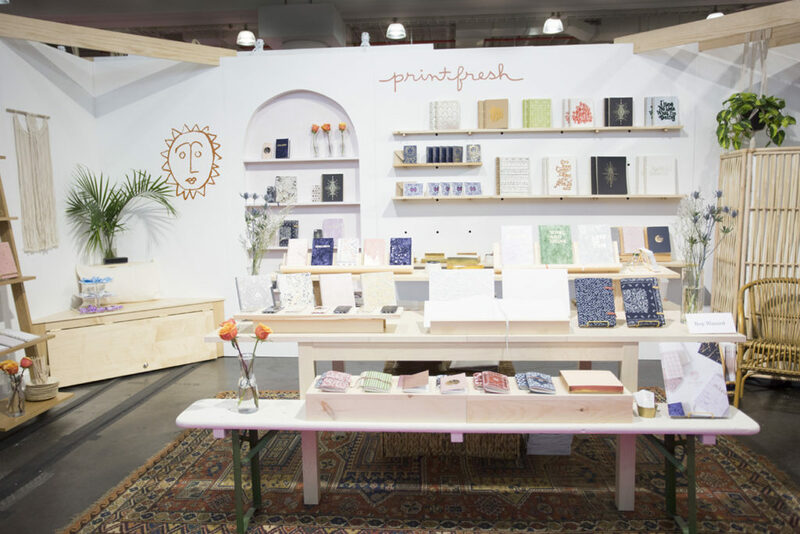 Team 624 recently had the opportunity to help our awesome clients, Printfresh, with a marketing strategy for their premiere at The Stationery Show in New York and wanted to share some of the social tactics we found especially helpful in making their very first show a success. Digital Flirting. Since it was their first show Printfresh didn’t have a large email list, so we had to get creative in how we attracted buyers to their booth. We used Instagram to identify target retailers + media contacts, followed them and started ‘flirting’ with them before the show even started. This means liking and commenting on great content they were sharing and mentioned them in our posts when it made sense. Remember to always be genuine in your engagement and not mass-target retailers! Tag, You’re It. We also monitored the show handles and hashtags and made sure to get involved in the conversation. We tagged our target audience in posts with captions “Can’t wait to see everyone!” as a way to cut through the noise and get their attention. Be sure to do your homework on bloggers or other influencers, like Sarah Schwartz of The Paper Chronicles and Stationery Trends Magazine or Oh So Beautiful Paper. Behind the Scenes Access. Instagram Stories & live videos are a great way to start talking about trade shows early. Printfresh shared videos of building & packing the booth, travel, silly moments during setup and product sneak peeks. Remember you can tag people in stories and always mention your show location (if you repeat it enough, your booth will end up on buyer’s lists). A Face to the Names. So much of our interaction happens over email and phone, that when we finally get to meet buyers/vendors in person, it can be a little awkward. Create feature posts on the staff that will be at the show so your buyers will feel like they know you ahead of time. Create a giveaway (make it good!) in exchange for an Instagram follow, post, or business card. Be strategic in thinking through what value you want to get out of your giveaway. 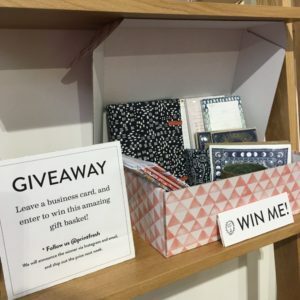 For Printfresh, we had a goal of 250 new followers during the show– so our giveaway focused on that. Be direct. If you can, dedicate someone to monitoring the conversation during the show. Buyers are on Instagram throughout the day, so it’s often the most direct way to reach them. We had great success by sending direct messages to the stores and influencers we most wanted to stop by ourbooth. In the know. Most shows have a social media lounge, so be sure to stop by and see what events and promotions are planned. 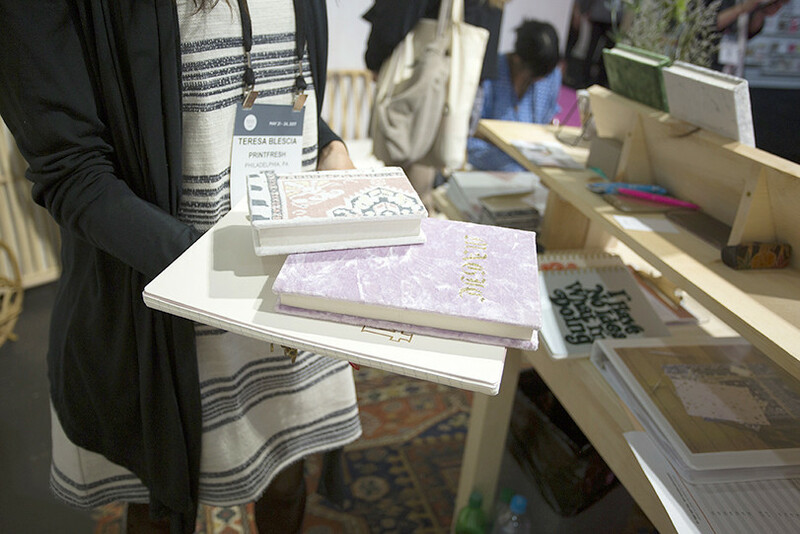 For example, we found out that the Stationery Show was doing daily takeovers– so we knew to be on the lookout for those people throughout the day. We were successful in getting Printfresh mentioned on the NSS Instagram, and opening the door to a number of new relationships. Create content. Trade show booths (despite the harsh lighting) can be a great space to create content that can be shared after the show. In addition to photos, Printfresh invested in creating a short video to tell the brand story and showcase the products post-show. Share your experience. Make use of all that great content you created! Create blog posts (or longer form Instagram posts) about what inspired you, what you learned, and all of the questions you answered. (Check out Printfresh’s 3 part blog series on the show). Reconnect. Make sure that you’ve connected with new accounts, prospects and any media contacts you made on social. Follow up via email and targeted social ads using the content that you created during and after the show. Stay present with them on social media too – when they post something you love, tell them in a comment or re-gram (always give photo credit!). I have always loved the gift and fashion markets for the sense of community that is felt throughout– from the shuttle buses to the hotels and restaurants, I love being around like-minded professionals who are all living creatively and driving innovation. We have a great opportunity to use social to extend this community to our online world, and keep it living long after these shows have ended. If you are interested in talking with us about your trade show strategy social media strategy, schedule a free consultation with us by emailing me at lmoreno@team624comm.com. Another great resource for creative entrepreneurs in the stationery industry is Tradeshow Bootcamp, run by the amazing Katie Hunt. Want to Learn More About Working with Us?